Soak up the magic of Christmas on this 11 day luxury tour through the Rockies. 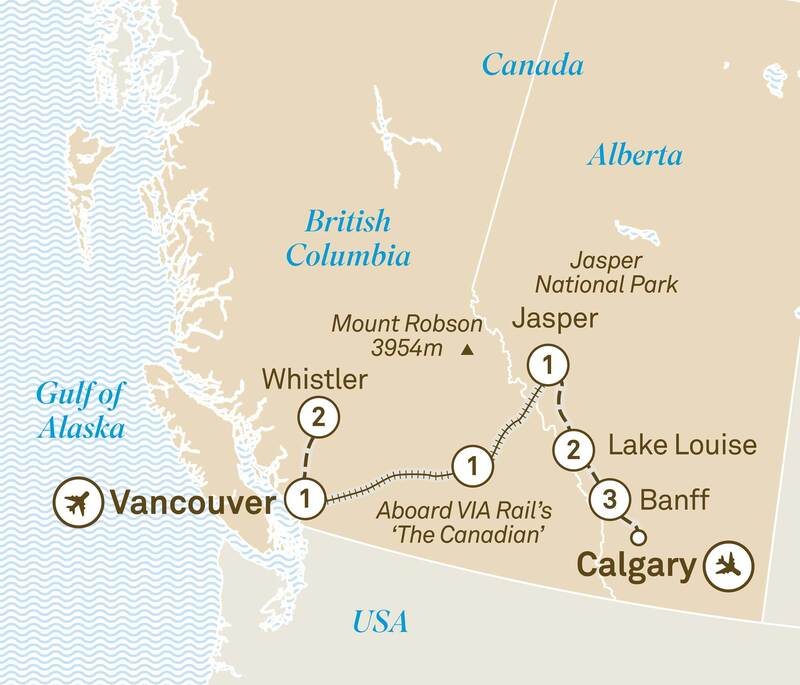 Visit Whistler, Lake Louise & Banff. Spend Christmas at an iconic Fairmont Hotel. From fairytale snow across postcard landscapes to elk that resemble reindeer; a Christmas in Canada is the perfect seasonal retreat. A 'white Christmas' will suddenly make sense and instead of one Christmas tree, you can look forward to vast forests of them. This itinerary will take you through a range of iconic Christmas spots, where you'll get to absorb the unique holiday atmosphere permeating the region. Enjoy the lights at the beautiful Butchart Gardens, a magical place at any time of year, but especially so as Christmas arrives. Take a horse-drawn sleigh ride in Lake Louise and enjoy dog sledding at Banff, where you'll spend Christmas at one of the Fairmont's iconic flagship hotels, the 'Castle in the Rockies'. It's sure to be more than just an idyllic Christmas, but one of your most enjoyable in living memory. Choose from the best food Whistler has to offer. Today is yours to enjoy however you wish in this quaint alpine village, nestled against a background of beautiful snow-splashed mountains. Discover the romance of rail travel tonight as you sleep in Sleeper Plus Class on board VIA Rail’s ‘The Canadian’. Awake with a sense of wonder to views of the Rocky Mountains from your private cabin or the glass dome carriage. Tonight, you’ll enjoy a cosy home at Fairmont Jasper Park Lodge in a junior suite. Tonight, choose between Canadian or Italian cuisine. Travel along one of the most spectacular drives in the world, the Icefields Parkway. Marvel at the unique, natural phenomenon of ice bubbles trapped below the surface of Abraham Lake. Explore this winter wonderland by helicopter, snowshoe and jingle to the bells of a horse-drawn sleigh. There are a variety of restaurants to tempt you this evening. Retire to your lakeview room at your two night Special Stay, Fairmont Chateau Lake Louise. Today, the man in the red suit is a retired member of the Royal Canadian Mounted Police. Make the most of your once-in-a-lifetime encounter. The Canadian Rockies will astound you as you survey them from the top of Sulphur Mountain. At this festive time of year, the Fairmont Banff Springs resembles a magical castle in an enchanted forest. To make your magical winter fairytale complete, you’ll be ensconced in a mountain or valley view room for your three night Special Stay. Indulge your palate as you please with dinner at a variety of restaurants at your hotel. Merry Christmas. If you’ve been dreaming of a white Christmas, then today your dream comes true. Celebrate a traditional Christmas Day brunch with the man in red, Santa Claus. Continue the festive spirit with a pre-dinner drink in the grandiose Mt Stephen Hall. At this time of year the incredible medieval-like hall, with its rare antiques, paintings and oak-carved ceiling, is decorated with all the Christmas trimmings. Savour a classic Christmas dinner before dancing late into the evening. Complete your Canadian winter experience with a dogsledding adventure or an icewalk into Grotto Canyon. Alternatively, you may choose to discover local landmarks and wildlife on a guided tour, or see the mountaintops from above in a helicopter. If you prefer, stay cosy in your ‘Castle in the Rockies’ and rejuvenate in the mineral pools of the Willow Stream Spa. Transfer to Calgary Airport for your homeward flight.